Apple's brand new OS has been revealed - but how does it compare to Android's KitKat? 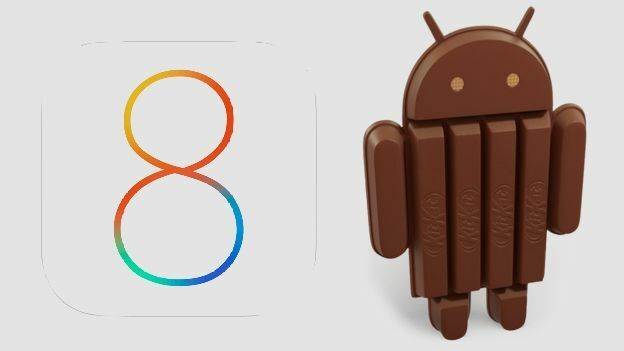 Apple has finally unveiled its latest OS upgrade, but how does it compare to Android's latest offering, KitKat? iOS 8 has changed little from the overhaul of iOS 7, and now many of its design cues are being used to shape the new OS X Yosemite upgrade for Mac, but it's not all one-way traffic. Extra sidebars provide added information when searching maps and contacts, and the notification centre, still accessed by dragging down from the top of the screen, will made it easier to respond to notifications by allowing you to swipe on the banner notification and type out your reply without leaving the app you're working in. Over on KitKat, fonts have been made lighter and thinner, with bold numbers and letters reduced across the phone's apps and programmes, but the OS is starting to lag behind in terms of design. iOS's beautiful transparencies give it the edge, and we're looking forward to Android 5.0 for that new lick of paint. Notifications: This feature has always been the pride and joy of Android users, and one that Apple had to play catch up on in iOS 6. However, it seems Team Ive has gone one better than Mountain View, adding the ability to respond to text messages without leaving your app, and opening up to third parties. Keyboards: Another long staple of the Android army, Apple has always been sniffy about opening up. With iOS 8 able to change to a third party keyboard and predictive typing added at last, it seems we've now got a dead heat. Caller ID: KitKat uses its Google business directory to try and identify unknown numbers if it's not stored in your contact list. Apple haven't cottoned on to how incredibly useful this can be - yet. Google wins this bout. Photo Editing: Both OS have increased the basic functions of their photo editing suites. KitKat's new photo editing tools include straightening, individual tools (e.g. contrast) and graduated filters. Plus non-destructive editing means your original files are always there for you to go back to. iOS 8 introduced more tools to their standard Photos app, including light and colour adjustments and autostraightening and autocropping. They are also included in Spotlight search results if tagged with particular location or person. This one's a draw. Voice Control: Apple has integrated Siri with Shazam on iOS 8, so it can identify any song and even gives you the option to buy the song straight from iTunes. It's also become touchless - you can activate Siri simply by saying "hey Siri" when on the homescreen. However, we still prefer Google Now, which works on selected smartphones with KitKat, bringing the microphone out of low-power state when you give the command. You can ask questions, give commands and perform a range of tasks without ever picking up the phone. Messages: KitKat integrates your MMS, SMS and Hangouts into one message thread, so you're not constantly switching between applications. This hasn't quite reached iOS yet, so you're still tapping away between apps to chat to the same person, however you can now send audio messages as replies to texts within the message app, if you're into sending little clips of your voice to your friends. Apple has finally jumped on the predictive text bandwagon, where Android have been sitting comfortably for some time. Android have made KitKat slicker, smoother and easier to use, promising faster response times and easier multi-tasking. iOS 8 has made similar improvements, tightening up the whole operation. Plus, you'll be able to view battery usage on an app-by-app basis, so managing your consumption is made even easier. We'd still say Apple shades this bout, especially when you take app reliability into consideration. Google have significantly decreased the number of RAM required for KitKat down to 512 RAM, so cheaper smartphones are able to run the new OS. This opens the OS up to emerging developers and markets, giving them the edge over pricey Apple. iOS 8 is expected to be available as a free upgrade on all devices around September this year and pre-loaded on the iPhone 6. Google will always prevail here. Both OS have made significant improvements with their latest updates, making everything that little bit more streamlined and effortless for us. However, we're excited about the small changes to iOS 8 that point to an exciting future. The move to hubs for content and the expansion to play nicely with third parties shows that the Apple ecosystem is about to expand, and while Google's roadmap is less opaque, it will have its work cut out with the next version of Android to make its glasses, wearables and services work seamlessly together. To get the full lowdown, catch up on our list of iOS 8 features.